Chelsea boss Jose Mourinho is expected to be in the dugout for Saturday's Premier League game against Liverpool despite facing a misconduct charge. 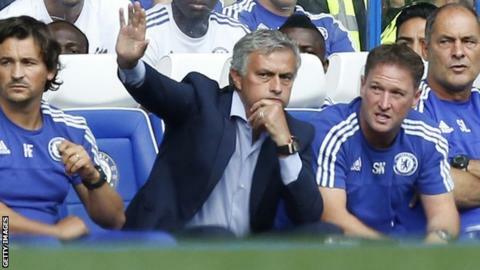 Mourinho faces disciplinary action after being sent off in last week's 2-1 defeat by West Ham. But those matters are not expected to be dealt with before the 12:45 GMT kick-off at Stamford Bridge. Mourinho, 52, has also lodged an appeal with the Football Association against a separate suspended stadium ban. Chelsea and West Ham were charged with failing to control their players and have until 18:00 GMT on Thursday to respond. Mourinho was sent to the stands after going to speak to referee Jon Moss in his room at half-time and he watched the second half from the directors' box at Upton Park. He also refused to take part in the post-match news conference. The defeat was the champions' fifth in the league this season and leaves them 15th in the table. Mourinho received a suspended stadium ban this month following comments he made about match officials after Chelsea's 3-1 home defeat by Southampton on 3 October. The latest charge is unlikely to trigger his ban but Mourinho could face a further suspension for his actions at Upton Park.